My mom came the United States from Vietnam in 1989. She resettled in San Diego, California, where she worked three jobs on Adams Avenue. During her two-hour bus ride to and from work, my mom studied and memorized her U.S. naturalization guide. It included segments from the Constitution, history and meaning of the flag, and a map of the fifty states and their capitals. To keep me quiet during our commute, she recited and quizzed me on my U.S. state capitals. I remember looking at the map and absorbing where each state fell on the page. I closed my eyes and, for example, saw California’s lazy recline, Louisiana’s boot, Maine the shape of an oven mitt. The map helped me remember not only the states’ locations, but their capitals as well. I didn’t know it then, but maps would be a very important part of my historical training. Of course we know maps guide us from one place to another. They help us visualize events and feelings. Military strategists plot violent operations on a map. In many public school classrooms, students press pins into states or international countries where they or their families are from or have visited over the years. These places of origin and vacation, as well as battlefields, summon associated emotions and stories about this, that, or the other. Sometimes we walk into a room and map where everything is. We map what’s missing or determine our course through the space, and in that sense, maps also function as catalogues, records, and indexes for the disappeared. I first used Odyssey in Professor Jack Tchen’s “Chinatown & The American Imagination” undergraduate seminar during Fall 2014. Jack divided the class into five groups. Each group researched a specific block in NYC Chinatown. They created walking tours and in-depth biographies of the block’s known and subaltern histories. To demonstrate changes over time or document fascinating artifacts, each student group created an Odyssey map for their final. 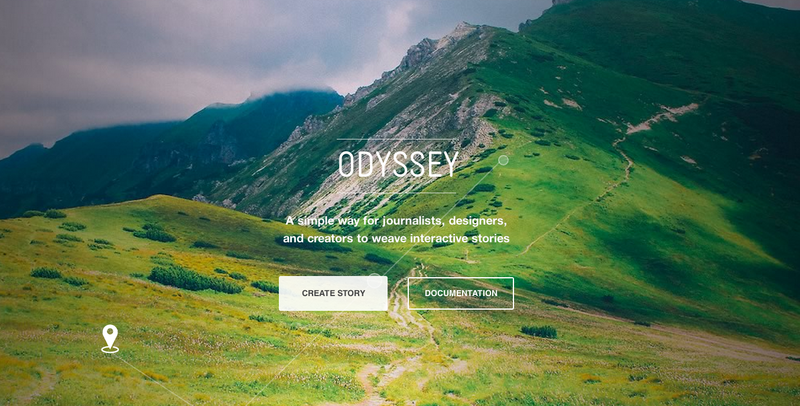 The Odyssey map made their subversive walking tours available online and, in fact, simulated the walking tour by taking the viewer on a visual journey. We’re currently culling all the student group maps and publishing them on a course site so interested teachers can implement Odyssey in their classrooms. The results were quite spectacular. Though some students were hesitant at first, they found Odyssey incredibly easy to use. That, of course, is one of its merits. Odyssey’s clear instructions and visual guides make building projects smooth and troubleshooting streamline. Because it’s still in development, some functions remain rather shaky. For instance, it’s unclear how we can edit or expand Odyssey maps after we publish them. It’s unclear if there are ways other than copying and saving the raw code to another location in order to work on a project in multiple sittings. It’s also unclear if projects can be worked on simultaneously by multiple people on separate devices. Above is an Odyssey example our students made. They examined the history of Chinatown’s Chatham Square. Landmarks, sounds, phantom highways, and political figures make their way into this project. A student even made her own video recording of a poem she wrote inspired by conversations she witnessed in the Square. The group overall really took advantage of the platform and inspired me to do the same on my project about queer Asian American life in Greenwich Village during the turn of the century. The importance of maps is that they present information in another way. While historians and researchers turn quickly to timelines and similar interactive features, maps aren’t widely regarded tools for visualizing, processing, and communication meaning of information. I argue maps can do the work we rely on timelines for. Imagine mapping events across time in the spaces they took place. Imagine showing human movement across space, in addition to time. It certainly takes historical scholarship out of the familiar realm of “past dates” and situates human events firmly within places, informing how we see and interact with them. I, in fact, cannot walk through Chatham Square without seeing, smelling, or hearing what the student group saw, smelled, and heard. My hope is in using Odyssey is to present sights, smells, sounds, and sensory details to people unfamiliar with Greenwich Village’s queer Asian American past and to trouble the ways that past continues to live in the present. Finally, the nice thing about Odyssey is that its developers welcome suggestions to aid their building the platform. Please feel encouraged to use Odyssey in mapping your next project and send some feedback their way! Imagine having access to every textile with a simple click of your mouse. In today’s, world accessibility is a must – correction, digital accessibility is a must. 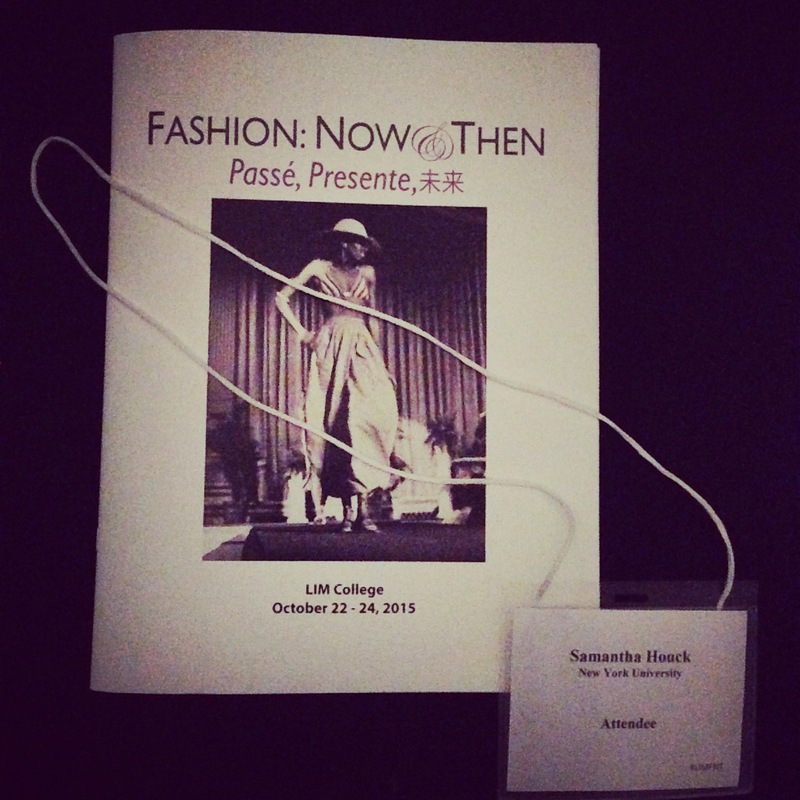 Recently, I attended the “Fashion: Now & Then” Conference at LIM College. During the conference, presenters and academics shared their research findings related to fashion studies and history. Many of the topics were similar, but one in particular stood out to me based on its relevance to our course. When beginning any research assignment an individual usually starts off with a general search. This search could be in the physical campus library or at home via their laptop. I always begin at my laptop. I brew a cup of hot tea; throw my hair into a messy bun, fire up my laptop and get down to business. Unfortunately, some types of research need a hands-on approach. You must go out into the public to find and work with primary sources. I am a bit of a research romantic. I enjoy handling treasures from the past. I also find myself appreciating the “non-hassle” research style of the Internet. I believe that for certain research is it necessary to work with materials in person. Research data bases and Online Archives such as Textile Hive challenge this ideal. Many fashion designers and researchers find inspiration from the past or world around them. Textile Hive is an example of an integrated archival collection. An integrated archival collection starts as a physical or digital collection and then makes a transition to encompass both the physical and digital collections characteristics. The Textile Hive boasts that its interface provides clear search, discovery and exploration experiences for its users. I find it difficult to believe a digital format can provide the same rich experience as visiting a physical archive. I do believe that Textile Hive fills a gap in making more textile collections accessible. Also, sometimes a physical archive must shut its doors. A digital archive provides a secondary outlet. It allows an archive or collection to continue. It is important to keep collections connected to people and to other collections. Textile Hive began in 2009 when Caleb Sayan digitized the contents of the Andrea Aranow Textile Design Collection with the hopes to reach a more extensive audience. Textile Hive’s ultimate goal is “to find a permanent home for the physical and digital collection with an educational institution, cultural organization, or other partnership to ensure that the collection be utilized, built upon, and preserved for future generations” (http://textilehive.com/pages/the-project). Since I am studying to become an archivist, I appreciate their goal. I appreciate their goal because it focuses both on the physical and digital collection. One of my favorite features of Textile Hive is their search capabilities. According to Sayan, there are over 18 different ways an individual can search their site. As a former teacher, I like that this site caters to various learners and allows for different search techniques. For example, you can search by: technique, material, condition, pattern, embellishment, and gender, object type, etc. Another cool feature is that you can compare two searches on the same screen. This feature would definitely come in handy for anyone pursuing an assignment about cultural studies. Besides providing a digitized image, Textile Hive also provides the necessary metadata and various informational videos. The videos explore topics like the historical context of the textile. I was impressed with the amount of visual exploration tools. Visual archiving will continue to grow as a means to promote the digital nature of today. Fashion and textile studies can provide powerful insight into culture, gender, political studies and much more. I found the “Fashion: Now & Then” conference to be inspirational as I continue to gather research about Mid 80s Fashion here in the East Village, NYC. There is much more to fashion studies than meets the eye.